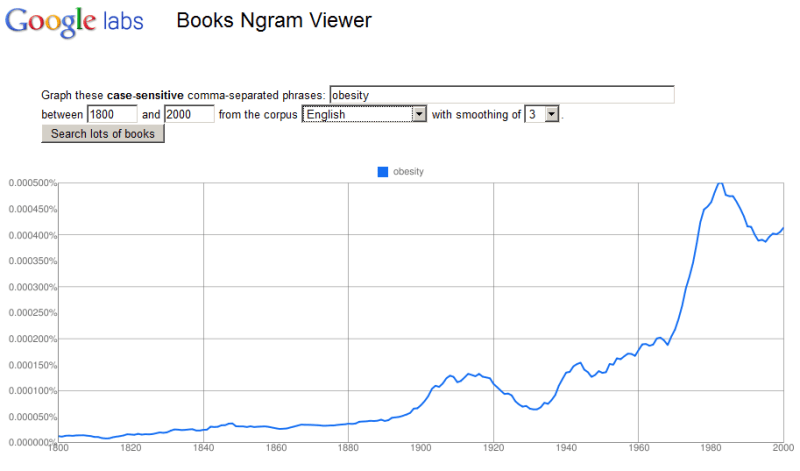 Following close on the heels of the Body Browser, Google comes up with another toy, which, on the surface, seemingly has no relation to matters health and fitness, but can actually provide some interesting results: the Google Books Ngram Viewer. What it does is put into a chart with what frequency over time in years words occur in the books Google scanned for their book database. And beside everything else under the sun that people wrote about, we can of course also use this to search for words related to diet, exercise and similar subjects. As you can see in the chart, the word picked up a first momentum around the year 1900, but lost it during the Great Depression, when many people fell into poverty and had trouble staying fed. Up from the 1940s we see am almost steady incline again, then a very rapid rise beginning in the 1970s and another drop in the 1980s, which is followed by another rise in the 1990s. It is interesting to ponder why these occured. The rapid increase in the 1970s can be explained; but why the fall in the 1980s? After all, the percentage of obese in the population hadn’t declined at that time. Play around with it and try other words. “Carbs”, for example, practically shot to the moon in the 1990s, while “bodybuilding” was almost non-existent until 1980. You can also try combining two words, as I did in this comparison of “vegan” and “vegetarian”. Well, I don’t know what happened, but I tried to log-in to the Ask Scooby forums and I’ve apparently been permanently banned. I was very upset and devastated by this. The forum is a life-line to me and I use it every day, I met lots of inspiring people who I can no longer contact at all. I’m really sorry if I said something that offended someone and I apologise to them but I really felt like that community was amazing and I feel very upset that I’ve been banned. If there is any way to lift the ban at some point, I promise not to put a foot wrong and I will specifically insist on posting only when I have something constructive to say and not offensive in any way. I mean, ban me for a week or two (a month even), ban that profile permanently and insist I come back with another one, but don’t ban me permanently for using that forum ever again, please. Hollis, you have flirted one time too many with being banned. Your disregard for our moderators and the contempt you hold for other people are detrimental to the community. What did you ban him for anyway?